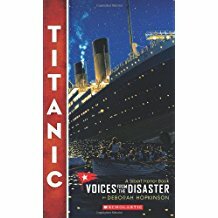 Summary: This book uses recollections and interviews from witnesses and survivors to put together the timeline of what happened aboard the Titanic and the aftermath of its sinking. The "voices" heard within range from third or steerage class to first class. There are accounts from passengers as well as workers on the ship. While it describes the emotions and actions of the people, the author also weaves in the mechanical details of the ship to explain why the Titanic sank. My Review: Initially, I found the book difficult to read because of the changing characters and trying to remember who everyone was. However, by the time the iceberg hit, I was fully enthralled with the book and could not put it down. Because the book is being told through first hand accounts, it feels as though you are really there. You also get to hear stories from every aspect of the ship and can finally piece together everything that happened that night. I have been a bit obsessed with the Titanic since I was about 7 or 8, only a few years before the movie cam out. This has to be one of the best books I have read on the subject. It also provides enough of a narrative feel that even those who are hesitant to read nonfiction can easily dig into the story. This sounds like a great book to be read. The Titanic is usually a good subject to get youth to read about. Melissa, hi. I think blogspot ate my first attempt at commenting so I'll try again. I was writing that having done my blog comments (for a grade) to those in my own blog cohort group I was looking at the blogs of our other classmates. The Titanic is a long-time interest of mine. I did my LitBit 4 (the graphics one) on the disaster. I could give you tons of other books to look at but I'll just share this one from the YA section: McPherson, S. S. (2012). Iceberg, right ahead! The tragedy of the Titanic. Minneapolis, MN: Twenty-First Century Books.